Pado became the first referee from Solomon Islands to officiate in a FIFA Beach Soccer World Cup when he took the pitch as third referee alongside Juan Rodriguez of Argentina, Rene de la Rosa from Chile and Panama’s Oscar Arosemena in his first match of the tournament. The journey to Ravenna was a big one for Pado who is a primary school teacher at Vancouver Community School in Honiara. 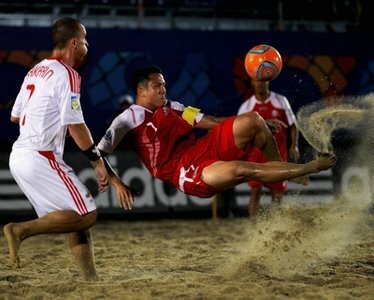 Starting his career as an athlete Pado was no stranger to the international stage having taken part in international athletic competitions before but no stage he has ever stepped on could match the euphoria of the FIFA Beach Soccer World Cup. Pado’s rise to the world stage was nothing magical and a lot of hard work was put into getting Oceania on the map. Behind the scenes the FIFA Referee Assistance Program (RAP) team for OFC was rapidly lifting the standard of refereeing across association football, beach soccer and futsal. Pado is one such product of the driver led by Tahiti’s Massimo Raveino and Solomon Islands’ Neil Poloso, the duo who fuelled the development of refereeing in the island nations. Pado took the pitch alongside Juan Rodriguez of Argentina, Rene de la Rosa of Chile and Oscar Arosemena of Panama in his first match at the tournament which saw Senegal edge 2009 finalists Switzerland 1 – 0 after the match finished in a 8-all draw. Stadio Del Mare in Ravenna was the venue for the match. Pado officiated as the third referee behind Rodriguez and de la Rosa. In his second match at the tournament Pado was part of the team that officiated in Italy’s penalty shootout win over Senegal. However, Pado’s status as a world class referee was confirmed in his third match when he officiated as the second referee in the match between Nigeria and Venezuela. Moving from third referee to second referee may mean that Pado may be on his way to the first referee position very soon. At this stage it is not yet confirmed if Pado will be officiating in the knockout stages but it is something that the refereeing fraternity in Solomon Islands wants to happen. Solomon Islands Football Federation (SIFF) referee development officer, Justin Mutukera, says that Pado is carrying the flag for all beach soccer referees in the country and he would very much want to see him go as far as he could. “Hugo is the beacon for beach soccer refereeing in Solomon Islands. His participation in the FIFA beach soccer world cup will surely inspire a lot more people to take up beach soccer refereeing,” Mutukera says. SIFF general secretary, Eddie Ngava, congratulated Pado on his achievement saying that he is an example for others to follow and also evidence that Solomon Islands is a leading beach soccer country. “Congratulations to Hugo for reaching this important milestone in his career. It is a great achievement for him personally but also for the Solomon Islands. I have no doubt that he deserves to be where he is now because he has worked hard throughout his career,” Ngava says. Pado is among only five (5) FIFA beach soccer referees in the Oceania region, 3 of whom are from Solomon Islands. Hamilton Siau and Simon Sabe are the other 2 Solomon Islanders while Dave Rajnish Rao and Faraz Hussein Mohammed are both from Fiji. Pado is the only referee from Oceania officiating in the current FIFA beach soccer world cup.